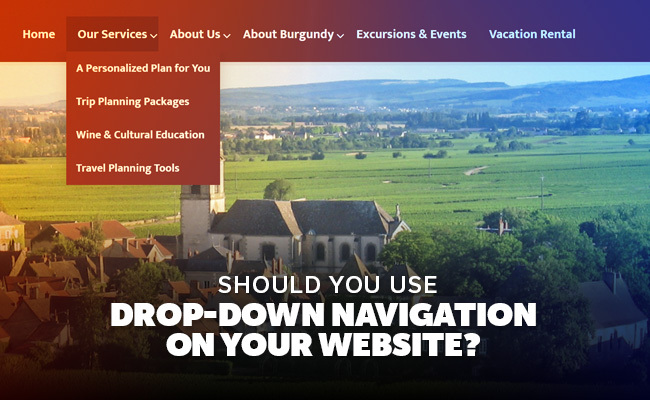 Should you use Drop-down Navigation on your Website? If you’re a website owner creating content, you absolutely need a content management system or CMS. Without one, creating and managing digital content is essentially impossible. And instead of being able to quickly find, retrieve, and repurpose content, you’ll be stuck creating content from scratch and wasting time and resources. to drop-down menus. 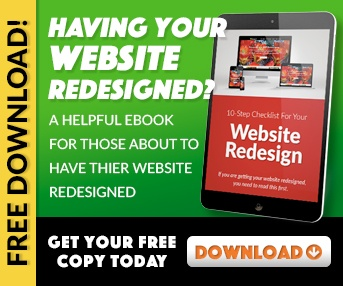 Are they the right choice for your business website? Drop-down menus can be a user-friendly design element. Menus and sub-menus are revealed when the user hovers the mouse over the menu item. Users are accustomed to this navigation scheme in other programs, making for an easy transition. By nesting links, the design of the web page is cleaner, with fewer links on the main page. It also reduces the number of clicks and page loads by making all the information accessible from a main menu area. When used properly, drop-down menus can be an asset to your business website, but you should consider several factors before using them. Related Post: The difference a professional website makes. More and more, people are accessing web pages from a variety of devices. Not making your web page mobile-friendly is one of the biggest mistakes in website design. Accessing a drop-down menu can often be difficult on a computer. Because menus are designed to open when the mouse hovers over the menu, one wrong move of the mouse could completely close the menu, forcing the user to start over. This is a frustrating but common issue with drop-down menu navigation, making it hard for users to click on the link they want on the first try. This problem increases on a mobile device. Mobile device touch screens don’t have the concept of hovering over a menu – when the user touches the menu, it loads the page. Touch screens rely on finger swipes and taps, which do not work well with roll-over style drop-down menus. You can design a specific mobile version of your business web page, but it is often easier to design your site with both computer and mobile needs in mind. If your website contains a lot of information and pages, drop-down menus can become large and unwieldy. With small amounts of information, a drop-down menu can provide a clean and obvious navigation for users. However, as you add more information, and therefore more menus and sub menus, this can become overwhelming for the user. While it may be obvious to you where various topics fall in the hierarchy, your customers may have to scroll through several large menus and lists to find the information they need. Larger menus can also cause problems for computer and mobile users alike. As the menus become larger, they may not fit on a single screen, even on a larger computer monitor. This is very frustrating for users who may not be able to access the links that are off their screen. 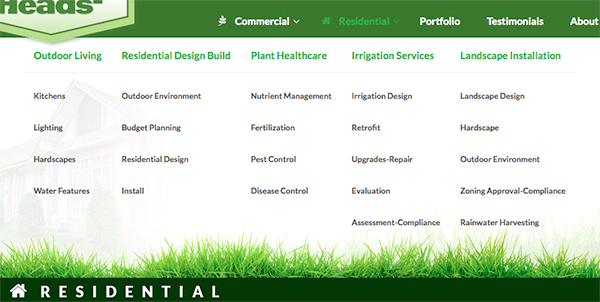 If you choose to use drop-down menu navigation on your business webpage, it is important to balance the amount of information given against the customer’s ease of use. In recent years, a new drop-down navigation technique has been used; it is called the mega menu. It is basically a menu that displays all of the menu options for a particular drop-down in one large menu instead of a narrow, single level drop-down. We placed an example of a mega menu is below. For Wordpress, we highly recommend using a plugin-in called Ubermenu. They have developed an amazing menu system that lets you integrate photos, tabs etc. They have examples on their website. The advantage to the mega menu is that it allows you to see a lot more information at a quick glance than a traditional menu system. Ultimately, the choice is yours. Drop-down navigation menus can work well in some situations, but in the increasingly mobile world, you may want to consider other options for your business website.